Children are naturally curious and sometimes they ask about some rather interesting topics. Having four boys bathroom questions come up a bunch! They want to know all the whys, wheres and whats with that whole process. It is no surprise that they have asked me what astronauts have to do. We have talked before but I didn't really know the answers until now. 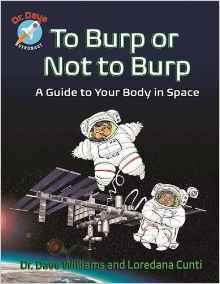 To Burp or Not to Burp: A Guide to You Body in Space by Dr. Dave Williams and Loredana Cunti goes where no one has gone before - bathroom in space. While that is just one of the topics included in this book, I will tell you it gives you plenty of information about burping, liquid or solid waste and even gas. It also goes through food, basic hygiene and so much more. This is a fun look at all those topics and it will really help answer those tough kiddie questions, the ones you haven't thought about but they have definitely asked you. By simplifying complex concepts with age-appropriate language and featuring actual photos of astronauts like Dr. Dave in space, quirky cartoon illustrations, fun fact sidebars, an index, and further reading suggestions – this jam-packed guide will keep young readers learning both in and out of the classroom, whether they’re aiming for the moon or studying the stars. DR. DAVE WILLIAMS made two flights on the Space Shuttle and performed three spacewalks on the International Space Station. He also lived and worked in the world’s only underwater ocean laboratory to become Canada’s first dual astronaut and aquanaut. He is currently the CEO of a hospital just outside Toronto. You can get your copy of To Burp or Not To Burp at your local book retailer or online at stores like Amazon.